BLOG: Disaster Relief - Thinking Development in Haiti - MEB Design Ltd.
Disasters come and go leaving behind wreckage that takes not days and months, but years to fix. As architects and designers we may not be able resolve mental and physical trauma, but what we can do is strive to build back a better built environment that can make some positive contribution towards a community’s healing process. On 12 January 2010 a 7.0 Richter earthquake hit Haiti causing a massive ripple globally. Thinking Development was formed in response to a call from the Sisters of St. Joseph of Cluny regarding the destruction of their schools and facilities in various parts of Haiti, in particular downtown Port-au-Prince. The Sisters wanted to reopen a downtown kindergarten and teach girls up to grade 9, enabling local Haitian girls a greater chance to find opportunities to progress, to dream, and have aspirations for the future. 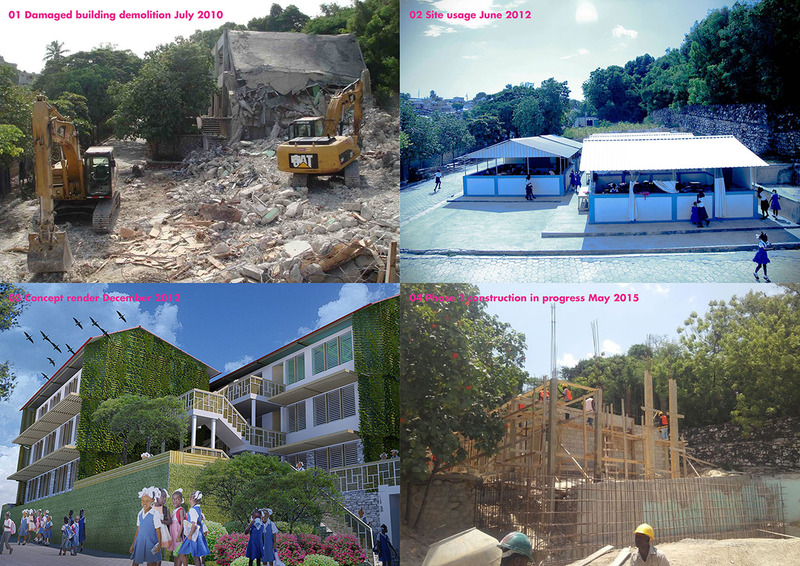 Thinking Development’s mission was to design and record the processes involved in the development of Centre Rosalie Javouhey (CRJ) girls’ school complex and set a precedent for a permanent, passive, vernacular, multi-storey urban school reconstruction to be replicated elsewhere. ​The site is located within an oasis of trees and natural foliage in Port-au-Prince, a heavily built upon hilly terrain, opposite Fort National (an informal settlement where living conditions are extremely difficult). The design therefore needed to compliment its immediate surroundings while evoking in the local community feelings of inspiration, creativity and the drive to learn and succeed. Our initial research into local construction projects in Haiti revealed that most of what was available to Haitians by way of reconstruction support was temporary shelter, or single storey bungalow style structures more often than not, best suited to rural settings as opposed to the uber-dense urban context. Moreover, many of the single storey buildings on site that did not collapse were not disaster resilient nor deemed structurally safe. In order to meet the accommodation requirements of the various facilities and the ideal student population of 1250 girls, the only way was to build up. Since my involvement with the project as the lead architectural designer, we formulated a 3-phased masterplan and concept design after a couple of years of consultation, design and redesign, professional advice and numerous team visits to Port-au-Prince. My trip in 2012 enabled me to understand the site and the many issues at stake, often conflicting, that I had not fully appreciated even prior to ​​completing a Masters in Building and Urban Design Development at UCL in 2011. There are many socio-economic and political forces at play and so one requires more than the mere desire to make a difference. Commitment, drive and belief in the project as well as the flexibility in our approach to interactions with various stakeholders were key personal characteristics that we as a group of individuals needed by default in order to keep going forward. This project has many unique qualities. Apart from having a 100% volunteer multi-disciplinary core team, it facilitates the reconstruction of a multi-storey school. It promotes a seismic, sustainable, modular and replicable design and encourages the capacity-building within the local construction industry. The process is documented in both video and print formats as tools to enable learning for anyone interested in post-disaster redevelopment to build back better. In December 2012 we held our first major project screening event showcasing the design in order to promote the project and begin fundraising. The following year we began producing a fundraising strategy, which culminated in a Thinking Development Crowdfunding Campaign that helped to raise $65,000 (£41,014) by December 2013. Since then the #ThinkingGirls campaign has garnered support from various schools in the UK and Ireland with many small and private fundraising drives on our behalf raising the combined total raised to $300,000 (£200,000) to date. Through the 2014 publication of the book documenting our processes, the continuous dialogue with various stakeholders and the campaign support, we managed to negotiate the school construction partnership with locally based Fondation Digicel. They had a 3-storey classroom module very similar to ours that already had local planning permission. With some minor adjustments, we were able to ensure the Thinking Development design principles and the spirit of our ethos lived on in the built form. After 5 years, construction finally began in April 2015! Digicel are project managing the construction on site and helping with additional funding needed to get the first two phases built. For more information on the construction progress and project status please view the latest 3-minute video and website.